A landmark clock which featured in the 1981 romantic Scottish comedy Gregory's Girl is at the centre of a debate over its true home. But how did this striking piece wind up in a Lanarkshire shopping arcade - and will it remain there? It's perhaps unusual for a prominent landmark to go through something of an identity crisis - but then, the St Enoch Station Clock is not your average timepiece. The clock, which famously appeared in the film Gregory's Girl, was suspended from the roof of the old Glasgow station until its closure in 1966. It was distinctly Victorian, embroidered with an ornate frill as it ticked out the minutes and hours on Roman numerals. Even now, it is still fondly remembered as the place where young lovers would often meet before a night on the town. But just in the way that Glasgow residents were absorbed into Cumbernauld due to an overspill in population, so was the famous clock when it was gifted to the town by businessman Raymond Gillies in the 1970s. In recent years a debate has arisen over the clock's true home, fuelled by a number of bids to bring it back to Glasgow - most recently from Network Rail who want to install it in the revamped Queen Street Station. The tug of war over ownership is living proof that the clock's links with both regions are alive and well, according to Cumbernauld community councillor, and author of Cumbernauld Through Time, Adam Smith. He said: "I know people in Cumbernauld who have strong memories in St Enoch station, including someone who regularly met his now wife for dates under that clock. For him, the clock kept that association and link with Glasgow. "This debate has been going on for a while. I'm aware that within the last few years there has been a few approaches from Network Rail and others to secure the clock. "The argument is that, though St Enoch Station is long gone, it should be returned to Glasgow. "But the clock actually went to auction. Glasgow or the relevant train operator decided they didn't want it, and so it was bought by a private businessman and gifted to Cumbernauld for our 21st birthday. A lot of it was circumstance." 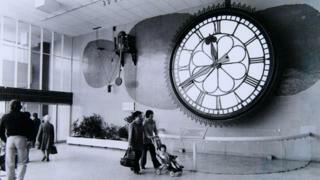 Be it a stroke of fate or not, Cumbernauld embraced the clock with open arms more than four decades ago. It was installed at a key pedestrian thoroughfare - an atrium between the town centre and the main supermarket Woolco, which is now Asda. The Queen unveiled the clock in 1977. Once again it was passed every day by thousands of commuters, and was even featured in Bill Forsyth's 1981 film Gregory's Girl - appropriately during the scene when Gregory waits for his date Dorothy. Eventually the walkway was redeveloped and the clock, now known to many as the Cumbernauld clock, was placed into storage. By 2005 it had been out of the public eye for roughly a decade, a move that incensed locals who regarded the piece as a cinematic treasure. Eventually it was hung in the newly built Antonine Shopping Centre, which opened in 2007 - and interest in its welfare was far from waning. Mr Smith said: "Cumbernauld does get quite a lot of tourists. "People come from all over the world to view it - it does have that legendary status. "Architectural students ask about it, also people who have the connection with the clock. They want to see it and make sure it's in good working order." Until last week, the area surrounding the clock was sealed off from the public amid developments at the shopping centre. It is now back on display, but questions have been raised over its future after Network Rail recently indicated their interest. The company hoped to acquire the clock as part of a £100m upgrade to Queen Street Station, which is due for completion in 2019. A spokesperson said: "We have committed to exploring the possibility of returning the former St Enoch station clock to a railway setting in the redeveloped Queen Street, but any decision on its future would be for the current owners to make." Councillor Allan Graham, who is chair of Campsies Centre Ltd, maintained the clock is an "important artefact in the town's history". Plans are in motion to find the clock a new home, but whether that home will be in Cumbernauld is unclear. Mr Smith said: "The problem is, the clock is very large and heavy. "The problem is finding somewhere structurally able to cope. The idea is it goes somewhere visible and accessible to as many people as possible. "Campsies Centre Ltd have kind of been custodians investigating various options - chances are it'll need to be a purpose built area to accommodate it."